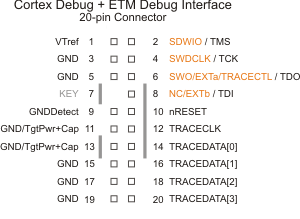 The ETM Interface connector provides instruction-level trace debugging support for the STRM32F107VC device. The 20-pin header (Samtec FTSH-110-01) is for connecting Cortex Debug and ETM Trace hardware. When using ETM Instruction Trace, the J10, J11 and J12 jumpers must be installed in the rightmost position. 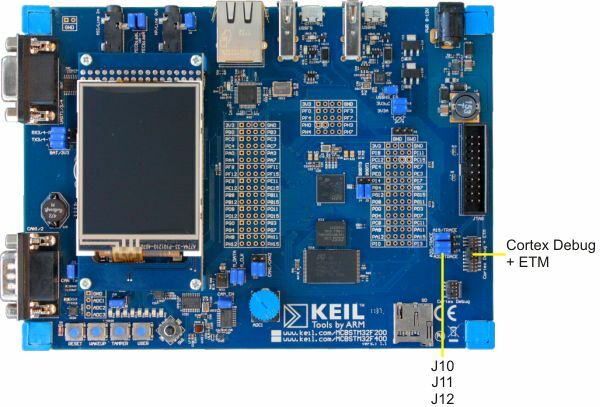 This allows ETM Instruction Trace, but limits the amount of NOR Flash or external SRAM to 1MB. Moving the jumpers to the leftmost position expands the NOR Flash or external SRAM limit, but ETM Instruction Trace cannot then be used.